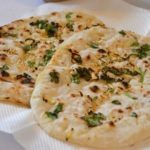 Garlic Coriander Naan is a Indian flat bread - Naan topped with garlic and coriander and baked in oven to form a delicious naan. 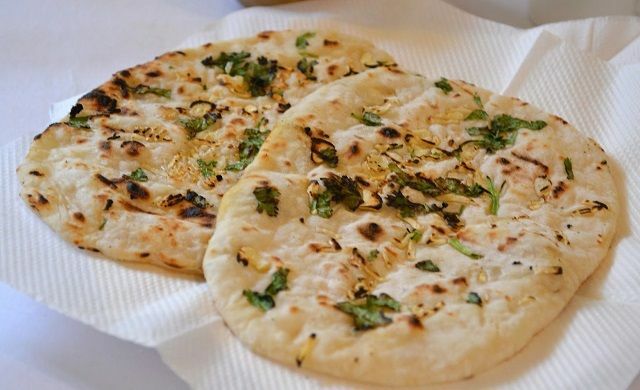 Get the complete recipe here for our Garlic and Coriander Naan Bread, the classic curry accompaniment. Sift the flour and salt together into a large bowl. In a smaller bowl. Cream the yeast with yogurt. Set aside for 15 minutes. Add the yeast mixture to the flour with the melted butter or ghee and add the chopped garlic, nigella, chopped coriander and honey mixing to a soft dough. Tip out the dough onto a lightly floured surface and knead for about 10 minutes until smooth and elastic. Place in a lightly oiled bowl, cover with lightly oiled clear film (plastic wrap) and leave to rise, in a warm place, for 45 minutes or until the dough has doubled in bulk. 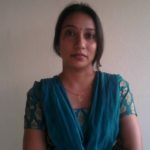 Divide into 3 equal pieces and roll the naan one at a time on a lightly floured surface about ¼ " thick. Preheat the oven to its highest setting at least 230 degree Celsius/450 degree Fahrenheit. Place 3 heavy baking sheets in the oven to heat and preheat the grill to its highest setting. Place the naan on the hot baking sheets and bake for 3-4 minutes or until fluffy. Remove the naan from the oven and place under the hot grill for a few seconds or until the top of each naan brown slightly. Wrap the cooked naan in a dish towel to keep hot while you roll out and cook the remaining naan. Brush with melted ghee or butter and serve.